New England Patriots News, 2-3, “The Patriot Way” or Belichick’s? Good morning, it is Super Bowl Sunday once again here in New England and here is your Sunday Patriots news 02-03. Some Quick Hitters this morning: *No AFC East notes this week* They’ll be back next week after the Super Bowl when we begin looking at the NFL Combine and Draft. But first some kudos this week. Congratulations to Ty Law for being enshrined in the Hall of Fame, very deserved to be sure. He was an integral part of those first Patriots championships, especially his pick-six in Super Bowl XXXVI. Hopefully, the voters will get it right with Richard Seymour next season. Kudos to Patriots fans: Sunday, over 35,000 fans showed up for the Patriots send-off rally at Gillette Stadium. It was the biggest one yet of any of the Super Bowl teams with Brady and Belichick. This flies in the face of the hit piece in the Boston Globe that tried to claim that Patriots fans are growing bored with the team’s success. The turnout on Sunday, television ratings all season long and merchandise sales all point in the absolute other direction. However, it should be noted that the flimsy “evidence” by the writer is coming from the same guy who said that Brady having a MAGA hat in his locker was hurting the team’s standing with the fan base two years ago. Way to go Pats fans, that was an incredible send off rally. For the first time, could the Patriots fans outnumber the haters at a Super Bowl? …What a concept. Kudos to WEEI: On Friday after with the buildup to the big game in full swing, ‘EEI swung … low and missed. How? By putting that noted hot-take artist Rob Parker on the air on Radio Row. Actually, calling Parker that is an insult to hot take artists, he hasn’t had an actual new thing or a hot take to say in years. WEEI decided to go for the lowest common denominator in their coverage. Don’t we have enough of that already on the air? What’s next? Is Baghdad Bob going to be guesting on the air, to talk about the political climate of the Super Bowl? Did you Know? With a win today, the Patriots will tie the Pittsburgh Steelers for the most Super Bowl wins (6) in league history. They are currently tied with San Francisco and Dallas with 5 wins. Did you Know Pt. 2: With a win today, the Patriots will move past the Steelers in all-time playoff victories with 37, the two teams are currently tied with 36. The Patriots already own the best postseason winning percentage with teams with a minimum of 15 playoff appearances. Team Wins Losses Win Pct. Did you Know Pt. 3: The Running game is a big part of the matchups this week. Since Bill Belichick took over the team in 2000, the Patriots are 51-1 when a running back cracks 100 yards rushing in a game. In 2018, Sony Michel had four 100-yard games and the Patriots were 4-0 in those contests. With the kickoff this evening, the Patriots will appear in their 11th Super Bowl and the ninth in the Belichick-Brady era and this dynasty is truly something to behold. The Patriots under Belichick have remained steadfast in his philosophy about building a team, which has been dubbed “the Patriot Way” and even today, two decades later, there are still misconceptions about that. In the Patriot way, which should really be called, “the Belichick Way”, there is a right way and a wrong way about building a football team that is constructed for the long run. And since 2001, the Patriots have far and away blown away the rest of the league in terms of staying competitive for a Super Bowl. A down year for the Patriots has been 10 wins or in the case of 2018, 11 wins. And yes, this was written up all fall as a down year, despite the fact that they’re one win away from their 6th Super Bowl title in 18 years. In watching some of the endless programs leading up to the big game, I’ve seen the same thing, much like we’ve seen every Sunday for the past 18 years. The analysts will point to the rosters and say “Team A has better personnel up and down the roster” and at that point, you just have to shrug and turn the channel. They don’t get it, have never gotten it and most unfortunately never will get it. Many teams, including this season’s Rams team, were the latest of the “dream teams” where they made a concerted effort to push all of their chips into the middle of the table and go all in for a title. They collected talent at every turn and didn’t see a free agent or trade scenario that they didn’t like. The fact that this team is unsustainable as it is currently constructed once they have to pay their QB who is still on a rookie deal is overlooked right now, but that day is coming. Belichick has always kept an eye on the long-term goal of not just building a winner but maintaining it for the long haul. Which is why they A. never overpay for veteran players who are looking for the huge payday and B. done their shopping with many players who aren’t considered top players but will fit a role in the Patriots (read Belichick) system. Look at this year’s Patriots defense, Kyle Van Noy and undrafted rookie free agent J.C. Jackson have become two of the most valuable players and some of their biggest performers down the stretch. Van Noy was considered a bust and the team got him for a song (6th round pick). Jackson went undrafted and has now worked himself into the starting rotation at cornerback. On the subject of Van Noy, Belichick, rather than focusing on what he can’t do or trying to force him to do what the team wants, he’s learned what he does do well and puts him in a position to succeed. And he’s had a career resurgence with the Patriots. Belichick once spoke about the mistakes some coaches do with trying to squeeze a player into a system where the fit may not be the exact right fit. That’s why the subject of “dream teams” is always interesting. Collecting all the talent doesn’t necessarily mean that those pieces will gel together. The Eagles a few years ago tried to buy a Super Bowl and then fell flat in the regular season. Not only do they have to fit what you’re doing but they also have to fit within the confines of the locker room. Back to the Rams, watching television this week, I saw more than one analyst say, as we mentioned above, that the Rams defense is “more talented” at nearly every position than the Patriots. Is it true? Maybe so. But as a unit? Hmm, the numbers don’t attest to that. Looking at yardage, which everyone always has a fit over here in New England, the Rams allowed a half-yard less (yes 0.5 yards) per game than the Patriots. In points allowed (which Belichick preaches) the Rams were 19th, the Patriots 7th. Hmm. Part of this philosophy is by design, Belichick knows how to build a football team and knows what will or won’t work. And part of it is by necessity. Because of their success, the Patriots are always picking in the #30-32 range in the NFL draft. You’re not going to find too many Khalil Macks or the next Randy Moss in that range very often, if at all. And the draft, as Belichick knows, beyond the first half of the first round is often times a crap shoot. Some players take longer to develop at the pro level and some peak in college and never work out. Which is why the Patriots would rather package picks and move down further to amass more selections which gives them a better chance at hitting on one of their prospects. Belichick has a penchant for finding veteran players that fill a complementary role rather than being superstars and fit the team-first mentality. Which is why players like Van Noy and others that they’ve added in the years before have nearly always filled valuable roles for the team in their continued success. One of the more prevalent myths that surround Belichick, and one we hear often is “GM Bill is hurting Coach Bill,” as if this is a no-brainer. And it is as wrong as rain on a wedding day. It isn’t “luck” as some talking heads would have you believe that the Patriots have been in 50 percent of the Super Bowls since 2001. No doubt it has been fantastic coaching but it has also been having an outstanding eye for talent. Talent to fit your team, your system and your locker room. Have they hit on everyone? Of course, not. They’ve had plenty of swings and misses. However, Belichick and Nick Caserio have done a fantastic job of assembling a scouting staff that has been able to identify talent that is out there that nobody else has seen and identifying the players that want to win championships. And that is the final piece of the puzzle. Lots of teams make the noise and spout the old clichés about “team-first” mentality and such but much of what you hear is just that …noise. Belichick has said this also in the past during the draft process. “We’re looking for people … [who] have gotten over themselves, and you can tell that pretty quickly,” Belichick said. “You can talk to somebody for four or five minutes, and you can tell if it’s about them, or if they understand that they’re just a piece of the puzzle. So we look for that. Not many players are willing to give up their individuality, their stats, and their quest to get paid the most at their positions to win a championship. That’s another reason the Patriots success has lasted so long. They are like a chameleon, they can change their identity from week-to-week and adjust accordingly to create mismatches against their opponent. A receiver could have 15 targets one week and be the team’s go-to guy and the next to be relegated to a mere decoy if the coaching staff feels, that they need to go run heavy and throw the ball elsewhere. If a player can’t handle that, he’ll either not sign here or soon find himself being released to take their talents elsewhere. Brady is the final piece of Belichick’s “Patriot Way”. Having a QB who is the best to ever play his position and do it for so long has made Belichick’s job of sustaining excellence for so long much easier. Brady was the outlier in the draft process. The guy no one including Belichick had the slightest idea would have ever thought would become the player he has. 198 players were selected before Brady in the 2000 draft, and the Patriots passed on him thru six rounds. Brady outworked everyone and continues to inside the Patriots clubhouse. He’s totally bought into what Belichick preaches. And when the greatest QB to ever play the game buys in, if you’re a veteran and a role player, you think you’re going to buck the system? And Brady has become the perfect foil for Belichick. We’ve all heard about the Monday film sessions where Belichick, as Tedy Bruschi as said, would “MF everyone”, even in big victories, pointing out mistakes in the endless quest for perfection. He frequently picks on plays made by Brady. The point being, if Brady’s going to get roasted, then you had better “Do Your Job” better than anyone else. Brady has also totally bought into the team-first mentality by frequently taking team-friendly deals where he’s taking far below market value to allow the team to spend more on supporting cast members of the team. He’s not even in the Top 15 list of highest paid QBs in the league in 2018. How will all of this play out later this evening? Nobody knows, it is after all one game where anything can and will happen. But I wouldn’t bet against the Patriots, who are battle tested and playing their best football at exactly the right time. That just isn’t the Patriot Way, that’s the Belichick Way. The Rams have a pair of dangerous 1000-yard receivers in Robert Woods and Brandin Cooks. How the Patriots choose to match up with the Rams tonight will be fascinating to watch. Stephon Gilmore practiced against Brandin Cooks all of last season, so he knows him well. But I believe (we wrote about this earlier last week) that Gilmore will cover Woods, who isn’t quite as fast as Cooks but is bigger. I think Jonathan Jones will cover Cooks with safety help over the top. Jones is speedier but… the Rams often put Woods in the slot, so that may fall to J.C. Jackson. So who will draw Josh Reynolds? Reynolds at 6’3 is too big and would present a mismatch against Jones. It is a interesting scenario. Our feeling here is Gilmore – Woods, Jones – Cooks, and Jackson – Reynolds. But anything can happen and the defense may end up switching things up. Jason McCourty is also in the mix and he could replace Jones in the matchups. 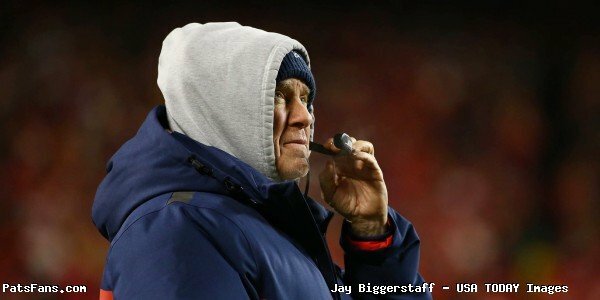 This entry was posted in 2018 Patriots playoffs, NFL Commentary, NFL News, Patriots Commentary, Patriots Film Room, Patriots Milestones, Patriots News, Patriots Rumors, Patriots Video, Super Bowl LIII and tagged Bill Belichick, Jason McCourty, JC Jackson, Jonathan Jones, Los Angeles Rams, New England Patriots, Patriots 2018 season, Sean McVay, Stephon Gilmore, Super Bowl LIII, The Patriot Way, Tom Brady on February 3, 2019 by Steve Balestrieri.